Aging comes with tough realities. Seniors may face the death of friends, family and even a spouse. They may face health and medical problems. Some may take more than a dozen medications each day. More than 6 million Americans ages 65 and older live with some form of depression, according to the National Alliance on Mental Illness. However, few seniors get the help or treatment they need. People wrongly assume that feeling down is a normal part of aging. Many seniors spend most of their time alone, so few are around to notice their depression or distress. When left untreated, depression can interfere with the lives of elderly loved ones, decreasing their quality of life and taking a toll on their health and well-being. Seniors with depression are at higher risk for illness, prescription drug abuse, alcohol abuse and even suicide. If you’re worried about your loved one, start with your doctor, who can complete a physical exam. 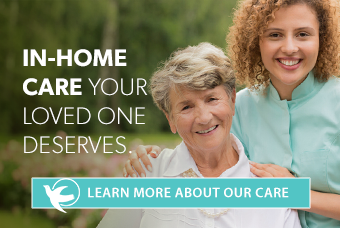 Consider hiring a professional caregiver, who can foster a caring and compassionate relationship with your loved one. He or she can assist with grooming, meal preparation and the daily activities of living. A professional caregiver can provide you and your family peace of mind, too, that your loved one is comfortable, happy and safe. In the meantime, keep your loved one connected and engaged as much as possible, to avoid social isolation that can lead to depression.